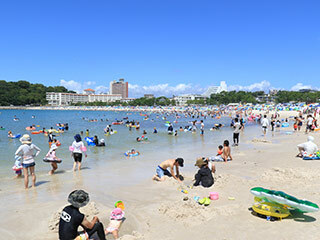 Nanki-Shirahama (南紀・白浜) area is one of the most popular tourist spots for Kinki region. It is located southern Wakayama Prefecture. It has a beautiful white sand beach and great Onsen. Therefore, this place had been a great resort since Nara period. It is also designated as the UNESCO World Heritage Site of Kumano Kodo. Drive Kisei Express way to Nanki Shirahama Exit. Use JR Wakayama Line to Wakayama Station. Change to JR Kisei Line to Shirahama Station.